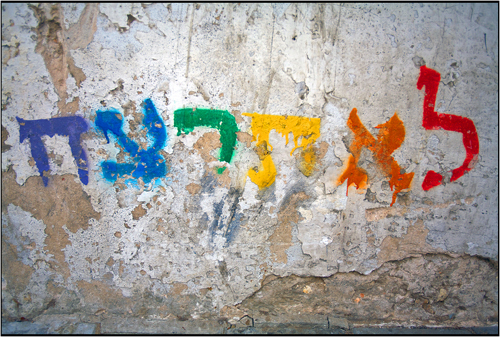 The Commandment “You shall not murder” is spray-painted on a wall leading to the Tel Aviv LGBT center where two young individuals were murdered a year ago. A masked man entered the center and opened fire on a youth group. No arrests have been made in the case. 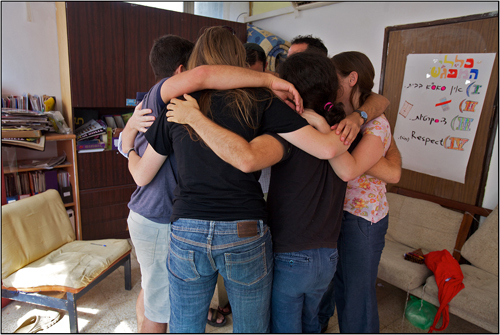 Organizers of Jerusalem Pride end a staff meeting with a group hug. 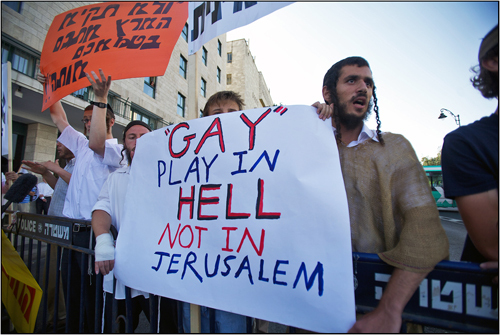 A group of young Americans were invited to the Pride House to hear three local individuals describe life in Israel as a homosexual. 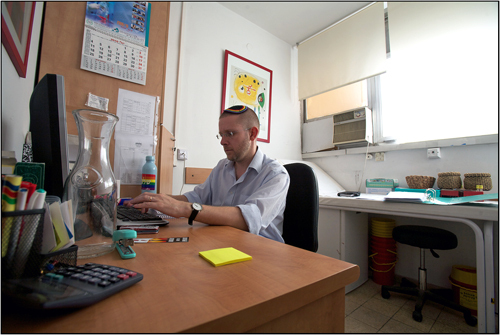 Binyamin Rose is the psychotherapist at the Open Clinic located inside Jerusalem’s Pride House, which is the only anonymous HIV testing center in all of Israel. 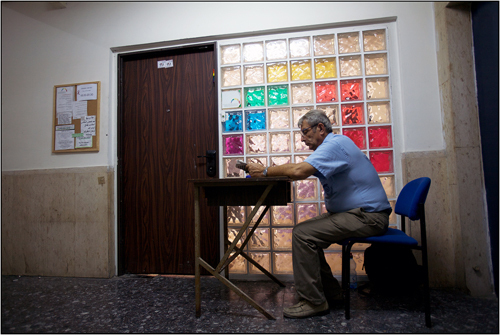 He is one of those amazing people who work under extremely complicated conditions to help people in need. 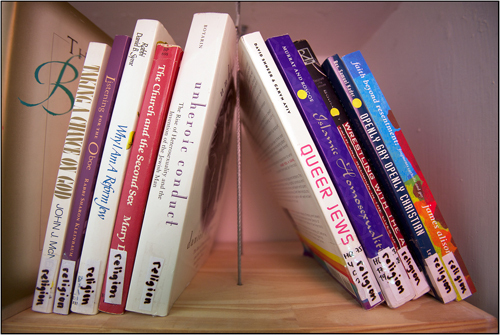 A small sample of the Jerusalem Pride House’s library. 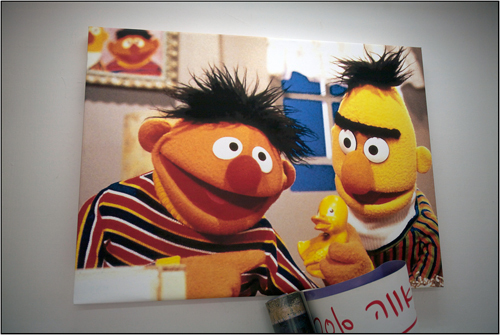 Everyone’s favorite gay couple in the office of Pride House. An armed guard sits outside of the Pride House’s door. The Pride goes on. I thought it was very well done, and extremely tasteful, with an obvious focus on Human Rights. 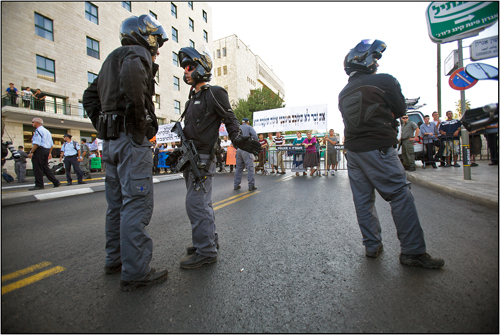 Because of last year’s shootings in Tel Aviv and the stabbing of three participants in Jerusalem’s Pride in 2005, there were over 1500 police protecting the Pride march and rally. A lone protestor stands quietly alone along the Pride route. 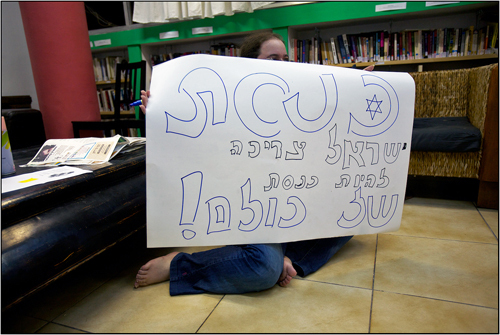 The Ultra-Orthox community may not be as violent as the skinhead protesters in Eastern Europe, but politically they are extremely powerful in Israel. 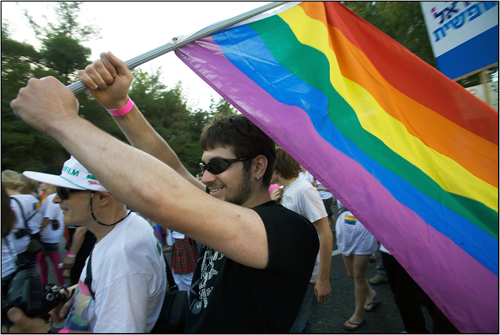 The Pride made its way up to a park just outside of the Parliament building. 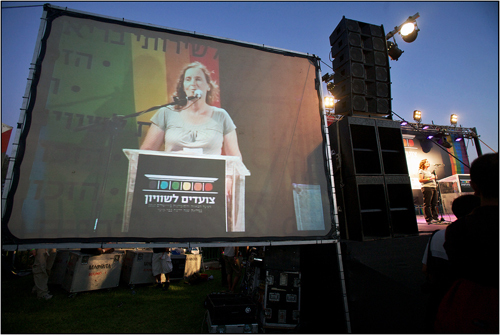 Ayala Katz, whose son Nir Katz, was one of the victims of last year’s shootings, gave an emotional speech about her hopes of ending homophobia. 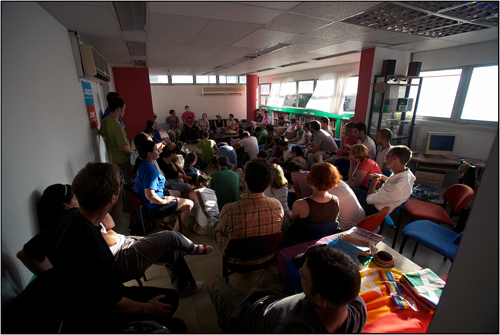 Ayala now heads an LGBT support organization for parents of the LGBT community in Tel Aviv. 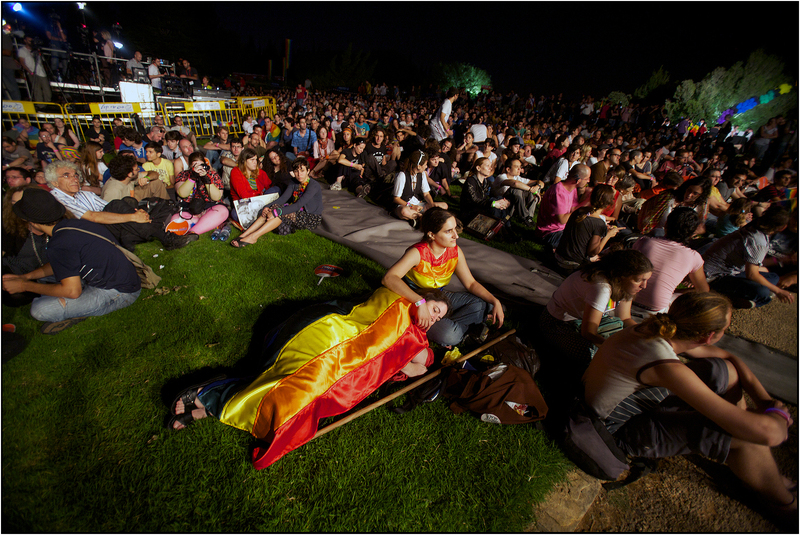 Participants enjoy the cool night air and listen to speeches made by members of the LGBT community. 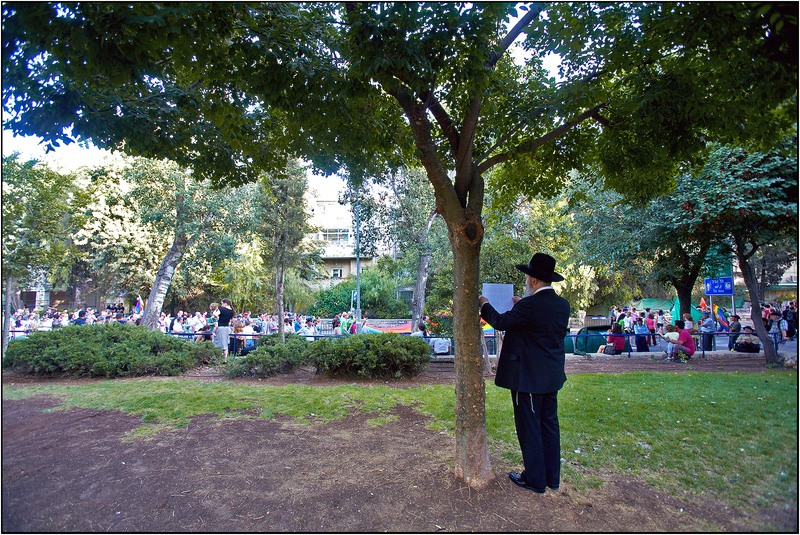 In Tel Aviv, thousands attended a candle light march in remembrance of those injured and killed in last year’s shooting. 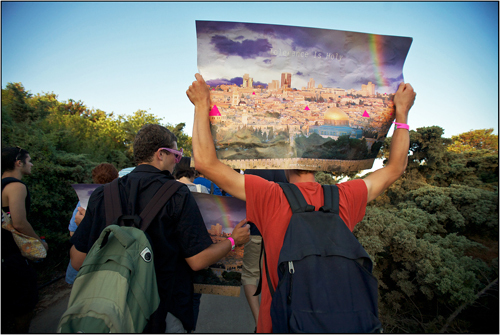 This entry was posted in Jerusalem Pride and tagged Israel, Jerusalem, Jerusalem Pride, Jerusalem Pride 2010. Bookmark the permalink.